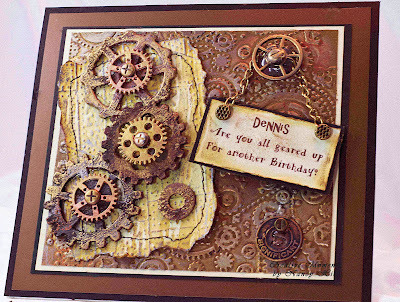 Welcome back and excited to share a mixed media birthday card for my brother with all of the wonderful products of Tim Holtz-Idea-ology and Prima Marketing from The Rubber Buggy. 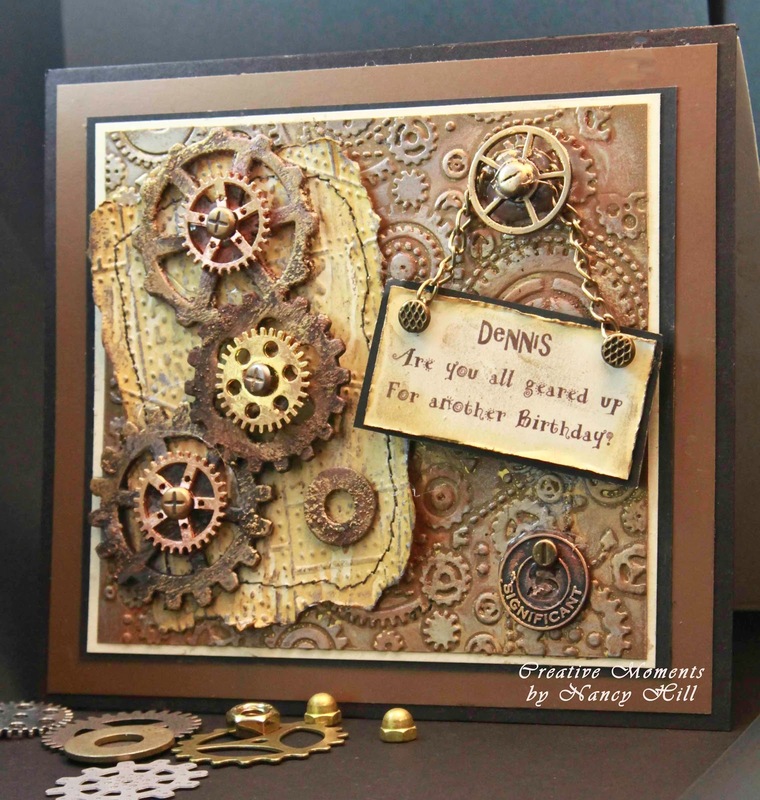 My card measures 6" x 7". I started with embossing some metallic brown paper with the Tim Holtz/Sizzix 3-D Mechanic Embossing Folder and colored the paper using Prima Marketing Art Alchemy Ginger Sparks and some of the Prima Marketing waxes listed below. 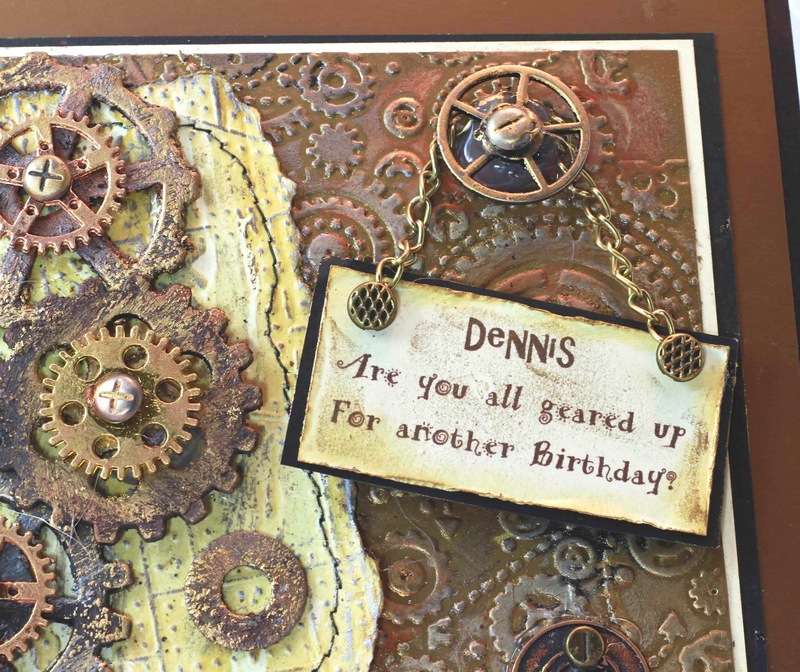 I love using the Prima Marketing waxes since it provides a nice metallic sheen on this paper along with the Prima Marketing Art Alchemy Ginger Sparks. 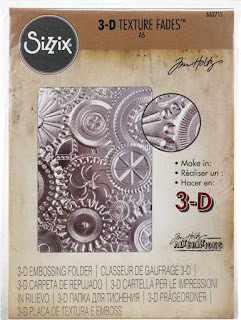 I just use my fingers to smear these waxes and Sparks on the paper and gears. I first applied the black gesso in the Prima Marketing Finnabair Art Basic Mixed Media Essentials Gesso Sets on the gears and screws and let dry before applying the waxes and Sparks. I typed the sentiment on my computer and printed it out on cream card stock. 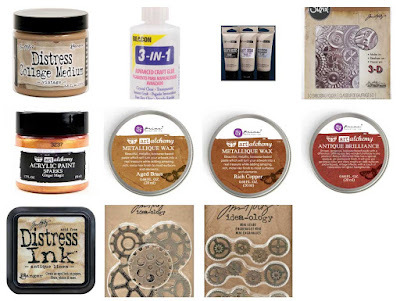 I applied the Tim Holtz Distress Collage Medium Vintage cream using my fingers on the cream paper along with Tim Holtz Distress Antique Linen ink using a sponge on the edges. I used a sewing machine to sew around the edges before gluing it with the Beacon 3 in 1 Advanced Glue onto the card and then use a hot glue gun for the gears and screws onto the card.